When we invited Keune Haircosmetics to our New York City studios to shoot a men’s collection, our photo team was thrilled when our tattooed-from-head-to-toe model arrived at the casting. Sure, his aesthetic might not speak to the everyday client, but there’s something so cool and unique about his look. Imagine my surprise when reviewing the photoshoot collection submitted by beauty photographer and BaBylissPRO VP Luis Alvarez to see our “unique” model appear once again—this time sporting an entirely new look! I called Luis immediately—how, out of all the models available, did we end up with two photoshoots with the exact same man?! When I talked with Maggie to see if she was as surprised as I was, she was a little less shocked but saw the bizarre factor. Maggie and I laughed about the “hot felon”—the mugshot that went viral and transformed an inmate from prison to Fashion Week—was that the turning point? “Ever since he hit the market, everything’s changed—the gloves are off!” she says. This annual men’s issue of MODERN is always one of my favorites. If you’re not currently working on your skills in the men’s market, you’d better roll up those sleeves and get going. “If you have a traditional female clientele, think about all the opportunities that represents: kids, boyfriends, husbands—you don’t want them to go somewhere else; you want them to come to you,” Luis says. Not only does this represent a huge percentage of potential income, but male clients are also loyal, they buy product, and they come back more frequently. “The hairdressing community can’t afford to turn its back on men,” Luis says. We agree. Neon Green, Neon Teal and Black were used to create this oil-slick-meets-mermaid finish that Aloxxi calls Revelry in Tivoli. This technique from Alfaparf Milano showcases a cascade of ruby and copper that glistens with specks of gold. Instagram has become a great tool for emerging and established barbers. THE LOOK: ALL STARS, the TV series focused on head-to-toe makeovers, is announcing the official partnership with the North American Hairstyling Awards (NAHA), the premier photographic hairstyling competition. 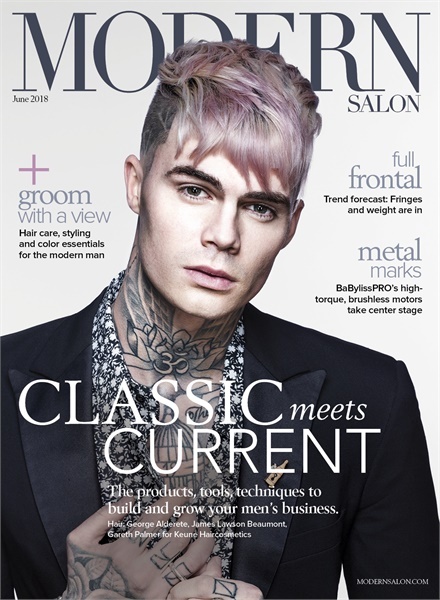 Friends, collaborators, and beauty professionals with a guy-centric focus, Diana Schmidtke (@dianaschmidtke1) and John Mosley (@popular_nobody) talk about their work and the intersection that is happening in men's grooming. Recreate this edgy look on your clients and help them unleash their inner rockstar. One of the hottest and most exciting categories in the industry is men’s grooming. Is there room for a new line? Yes, and 1922 by J.M. Keune is meeting the needs in this arena with a beautifully packaged and complete line of hair care, grooming, styling and color essentials.